If you are a younger person who avoids theater because you think it doesn’t speak to you in a language of music or movement or story that you speak in, there’s a show you should see. If you are an older person who finds it difficult to appreciate the language of music or movement or story that speaks to the current generation, there’s a show you should see. 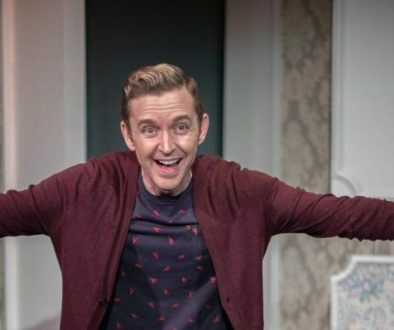 If you’re a person who avoids theatre because you rarely see faces or hear accents or even see a style of dress that represents you on local stages, there’s a show you should see. 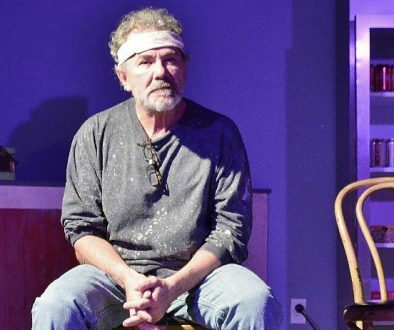 If you’re a local theatre artistic director who avoids scheduling productions that demand diversity in casting because there just isn’t enough talent around to fill those roles, there’s a show you should see. 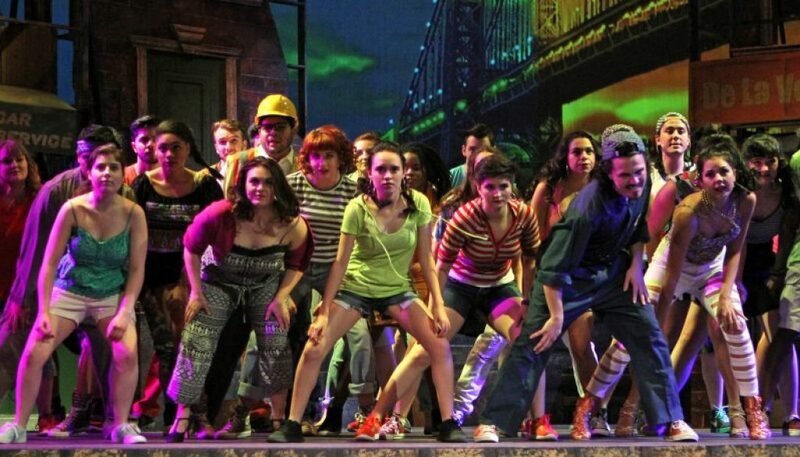 The final show of Santa Rosa Junior College’s production of In the Heights runs today in the Burbank Auditorium. Directed by John Shillington, it is an explosive and passionate celebration of family and community, brimming with young talent whose energy will exhaust you. Lin-Manuel Miranda’s first theatrical project (apparently, he has another show running right now) is set in the Washington Heights neighborhood of upper Manhattan. The neighborhood is chiefly populated by people of Dominican descent and it’s their tales of their culture, their families and their dreams that are the basis of the show. Usnavi (Joseph Miranda) is the shows “narrator”. He runs a small bodega with assistance from his cousin Sonny (José Del Toro). He pines for Vanessa (Sarah Wintermeyer), who works next door at Daniela’s hair salon. Usnavi dreams of moving back to the Dominican Republic, where he was born but of which he has no memories. Vanessa also dreams of moving out of the barrio, but her preferred destination is a Greenwich Village apartment. It’s the July 4 weekend and Nina (Jenna Vice or Katerina Flores in the double-cast role) has returned home after her first year at Stanford University. She’s struggling, both with her education and with her relationship with Benny (Cooper Bennett), an employee of her parents’ (Evan Espinoza, Julia Kaplan) car service. Nina isn’t sure about her future, while Benny dreams of running his own business and of a life with Nina. Her parents see things differently. Neighborhood characters weave in and out of these tales, all under the watchful eye of Abuela Claudia (Jackie Diaz), the neighborhood sage who may hold the ticket to many of their dreams. 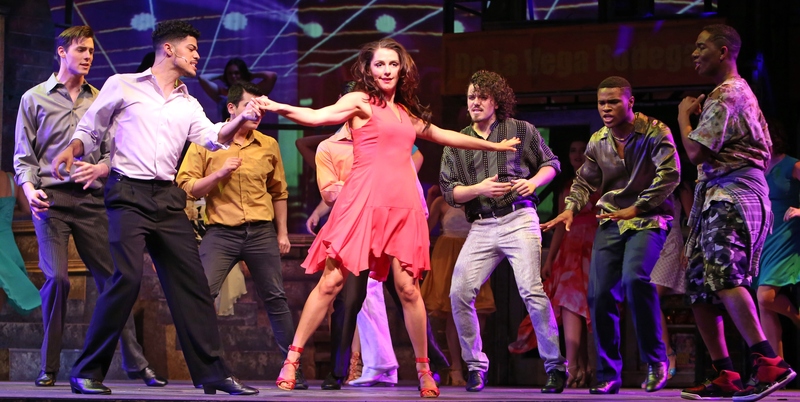 Most of the tales are told through song, and Miranda’s salsa, hip-hop and rap-infused score – no doubt a challenge for any musician accustomed to the usual musical fare performed in these parts – is well handled by the nine piece, on-stage orchestra under the musical direction of Janis Dunson Wilson. Vocal director Jody Benecke worked the cast hard and it shows, particularly in turning an operatically-trained singer (Miranda) into a very credible rapper. There are over twenty songs of varying styles performed and whether solo, duet or ensemble numbers, whether a ballad or comedy number, they are all delivered with gusto, passion, and character. This cast can sing. Movement is also a key component of this show, so much so that three choreographers are credited – Sam Browne, Cassandra Hillman, and Anakarina Swanson – with Browne being responsible for the salsa numbers. The choreography is much like the show, passionate and playful. The cast may be diverse in background and heritage, but what they all have in common is talent. 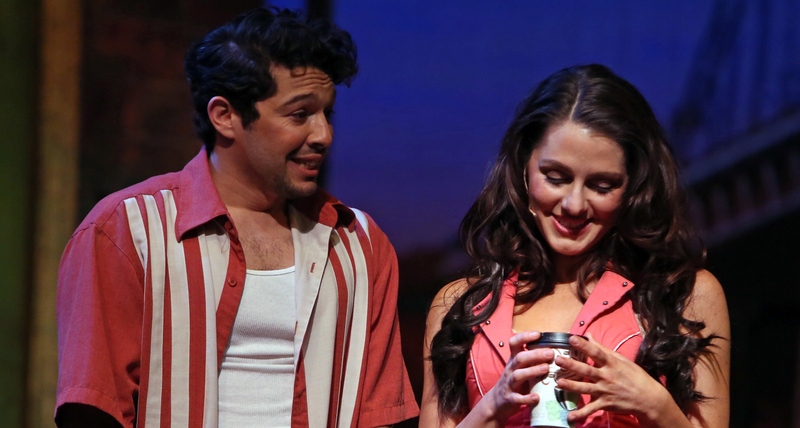 Miranda is charming as the awkward but sincere Usnavi. Wintermeyer meets the challenge of playing Vanessa as a strong, determined and independent women who can overcome the obstacles in her life and find room for love. The role of Nina was played by Jenna Vice at the opening night performance, and while it might not seem to be too much of a stretch for a college student to play a college student with all the problems that come with being a college student, she adds a depth to it that takes it beyond a simple stock character. Cooper Bennett’s Benny may be the most interesting character in the piece. As the “outsider” of the neighborhood (not Dominican, doesn’t speak the language, etc. ), he finds himself fighting prejudice from within a minority community. Bennett is a terrific performer and may well be the stand-out in an outstanding cast full of triple-threats. 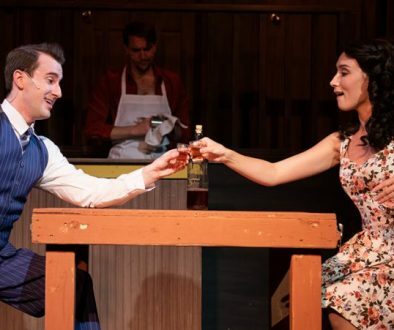 The ensemble is chock full of colorful characters, colorfully dressed by costume designer Maryanne Scozzari, who bring the neighborhood and the show to vibrant life. 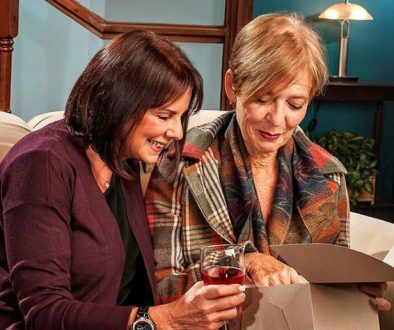 Jackie Diaz’s Abuela Claudia is the conscience of the neighborhood and of the show. Kristina Ibarra is sassy and brassy as Daniela, the salon gossip queen with a heart of gold. Chris Greenwood shows some nice moves as Graffiti Pete. Jordan Diomande has a voice and demeanor as sweet as the frozen confection he sells as the Piragua Man. Whether in the foreground or background, the entire ensemble acquits themselves well. Between leads, supporting characters, and ensemble there are over 30 theatre artists in this production. Everyone is doing something whenever they are on stage. Director Shillington’s attention to detail is superb. All of this activity takes place on a magnificent multi-level set designed by Peter Crompton, who is also responsible for the projection work, and under the creative lighting design of Vincent Mothersbaugh. Storefronts, fire escapes, windows, steps and stoops all become focal points at one time or another. Every inch of the stage is utilized. To have that many actors (and musicians) on stage with designs that functional is a testament to the collaborative process. If you’re a person who loves theatre, there’s a show you should see. If you’re a person who’s never experienced live theatre, there’s a show you should see. If you’re a young person stressing out about becoming the person you want to be, there’s a show you should see. If you’re a parent challenged by the decisions being made by your children, there’s a show you should see. If you’re a person in love, there’s a show you should see. If you’re a person who loves life, there’s a show you should see. 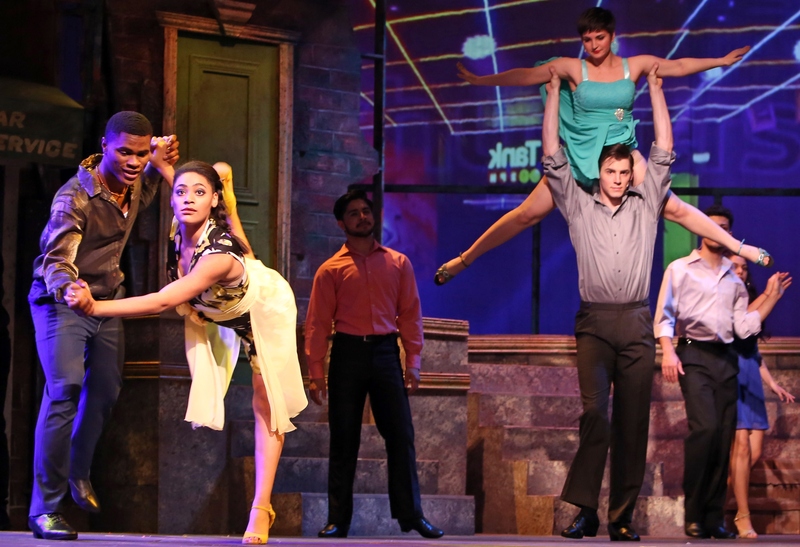 In the Heights, presented by the Santa Rosa Junior College Theatre Arts Department ends its run today, Sunday, May 7 at 3 p.m. in the Burbank Auditorium, 1501 Mendocino Ave.